NRA-ILA | Crayon "Gun" Subjects 5-year-old to Suicide/Homicide Screening and Non-Violence "Contract"
Crayon "Gun" Subjects 5-year-old to Suicide/Homicide Screening and Non-Violence "Contract"
E.R. Dickson Elementary School in Mobile, Ala., has introduced two new vocabulary words into their kindergarten curriculum: homicide and suicide. Local media outlets report that a 5-year-old was forced to fill out a bizarre safety agreement and risk assessment questionnaire containing those words after making an innocent gesture with a crayon. The kindergartner's mother told Mobile NBC affiliate WPMI that her daughter initially came to the attention of school officials after she drew an object resembling a firearm and "pointed a crayon at another student and said, 'pew pew.'" After the crayon incident, the child was made to fill out a "suicide/homicide assessment scoresheet" that included questions about how often she felt depressed, "past thoughts of hurting self" and "frequency of suicidal ideas." The 5-year-old was then made to sign a "contract" vowing not to kill others or commit suicide, all without a parent present. School officials also recommended that the kindergartner see a psychiatrist. Understandably upset, the mother told WPMI, "My child interrupted us and said, 'What is suicide mommy? Daddy what is suicide?'... As a parent that's not right. I'm the one should be able to talk to my child and not have someone else mention words like this in front of her at all." According to AL.com, the questionnaire and contract are part of a "one size fits all" policy for dealing with threats of violence. The story goes on to note that following the incident receiving national media exposure, Mobile County Superintendent Martha Peek has promised to "rework" current policy. Good idea. 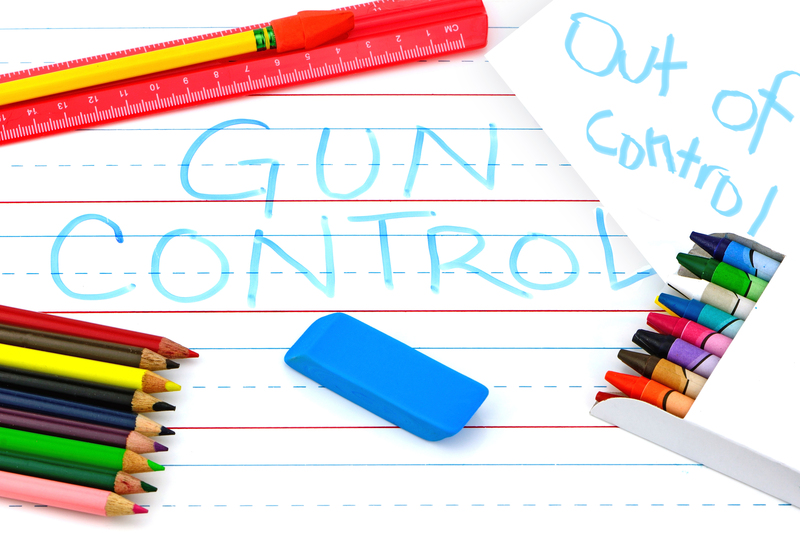 While any response other than perhaps verbal correction and removal of the crayons was unnecessary in the present case, the district's policy reflects the same sort of naïve, uninformed, and magical thinking that underlies most forms of gun control. Putting aside the farcical notion that signing a "contract" could actually deter homicidal or suicidal behavior in the first place, five-year-olds are legally ineligible to form binding contracts. Unfortunately, the type of zero-tolerance abuse at E.R. Dickson is all-too familiar, with other students across the country facing punishment for squirt guns, pointing fingers in the shape of a gun, and even a creatively eaten breakfast pastry. Incidents like these have led NRA to support legislation in states like Florida and Oklahoma to help stop zero-tolerance abuse. Legislation enacted in Florida makes clear that "[s]imulating a firearm or weapon while playing or wearing clothing or accessories that depict a firearm or weapon or express an opinion regarding a right guaranteed by the Second Amendment to the United States Constitution is not grounds for disciplinary action or referral to the criminal justice or juvenile justice system." The Mobile County Public Schools' outrageous behavior in this instance should prompt Alabama lawmakers to consider this important zero-tolerance reform. In the meantime, the Mobile County Public School officials responsible for needlessly subjecting a 5-year-old to decidedly mature subject matter might want to consider their own advice regarding psychiatric help.